While waiting for Atlanta and Miami to finish their business, and watching the never ending Chicago-Celtics games, I thought this is a good time to stop at the Apple App store in iTunes and see what type of basketball related apps are worth downloading. A quick basketball search in iTunes returned more Apps than I expected. In this post, I am only going to talk about Apps that I tried in my iPhone. NBA Game Time (Free): This is a must have app for NBA fans. 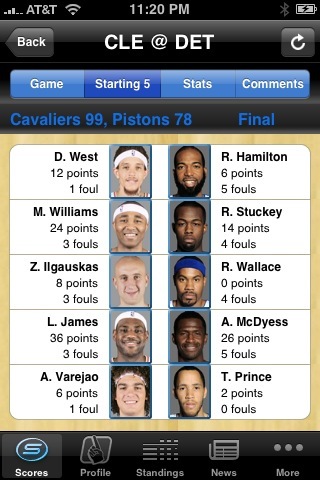 It is the official live app from the NBA. Right before the playoffs started, they released an update geared toward the playoffs. The App is simple and direct. It provides scores, standing, schedule includes TV schedule for each game, regular season standing, and playoffs brackets. 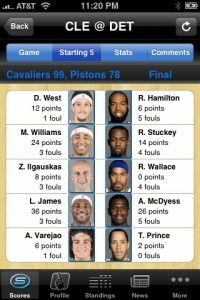 The app lacks news, stats (other than current game box score) and schedule by team. 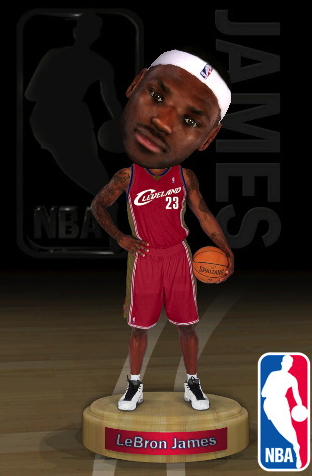 NBA Mini-Bobble ($.99): If you love bobbleheads then you might like this app. You can have your favorite player in the palm of your hand. You can shake, tilt, or rotate your iPhone and watch your favorite player go. It can get boring very fast and not sure if it is worth the $.99. However, as an added bonus, anyone who buys a bobblehead can click on a link and get 10 percent off merchandise of that player from NBAStore.com. 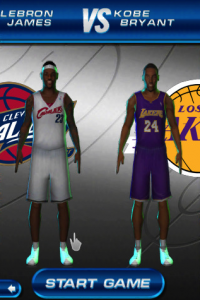 The NBA says that sales of LeBron’s virtual bobblehead are slightly outpacing the virtual bobblehead of Kobe Bryant. 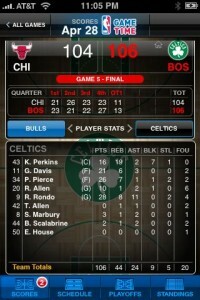 Flick NBA Basketball ($4.99): This app was just released by Freeverse Software. The app features five individual events starring real NBA players, one from each of the league’s 30 teams: everyone from the Boston Celtics’ Kevin Garnett to the Cleveland Cavaliers’ LeBron James, Kobe Bryant, Shaquille O’Neal, Yao Ming and many others. Sportacular (Free): This is probably one of the best sports app out there. The app provides up-to-the-minute scores, standing, stats, news for pro and college sports. 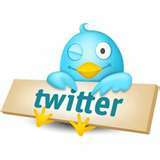 Sports include: NBA, MLB, NHL, NFL, MLS, NCAAFB, NCAABB (men and women). This application is a must have for the sports fan. The information is simple to access and it’s a very easy transition from one sport to another. You can also customize your settings a number of ways. You may wish to follow a single player or a team. By personalizing your settings you can quickly pull up information on your favorites. Fantasy sports junkies can follow the stats of their favorite athlete. You can also find the line on every game as well as the over/under for those of you who like to place a wager. 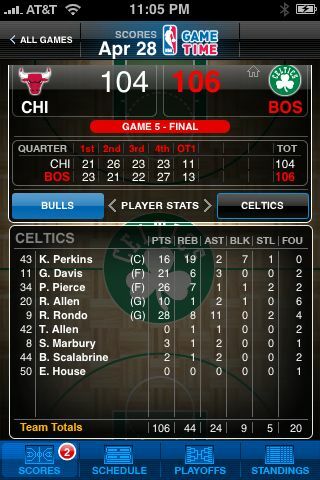 iSports (Free): iSports delivers near real-time sports scores and news, the best graphical sports experience in mobile. The application covers all major sports in the U.S. The interface is smooth and easy to use, and the score ticker at the bottom is nice for quick reference. The whole application has a nice gloss, but at times is a little overwhelming. It was my favorite until the company released its version 2 update which seems to be slow and crash often. Did you try any of these apps? Do you know of an app that I didn’t cover here and is worth the try? Please let us know your experience iPhone sports apps. How Have They Fared So Far?